When I was a child, one of my favourite books was Adventures in Archaeology. I was thrilled by Schliemann’s discovery of Troy; Sir Arthur Evans’ of Knossus, and, of course, Howard Carter’s spectacular discovery of Tutankhamun’s tomb. There was something very exciting about digging and finding something which has been hidden for hundreds, and sometimes thousands, of years. And I longed to see these places for myself. And I confess to still feeling that same delight now I’m grown up – or, perhaps, not so grown up. So when I actually saw the spectacular Bronze Age horses and chariot burial which made World News in 2008 under the Karanovo tell in Bulgaria, I assure you that the hairs on the back of my neck stood up. 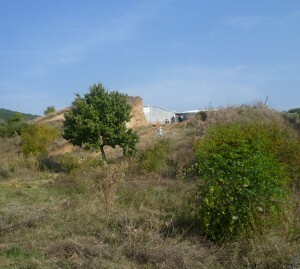 A tell is an ancient mound and Bulgaria has over 10,000 of them dotting the countryside. The Karanovo tell stands 12.40 metres high, covers 350 x 150 metres and dates from about 6000 BC. The horses and chariot burial I came to see dates from the 1st century AD, and it’s part of the tomb of a Thracian noble. We climbed a steep hill to a large covered space. 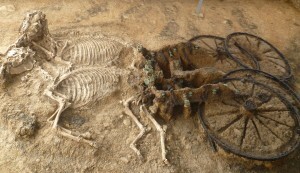 And there we saw the burial; the skeletons of two horses and the remains of a chariot with huge wheels. It had been left half-excavated as though the archaeologists had just nipped out for a coffee break and would be back any minute. I instantly realized that seeing something which looks only half dug up is even more exciting than seeing everything neatly laid out in a museum. Just think how wonderful it would be to be able to walk into Tutankhamun’s tomb and see everything in situ, just as Carter and Lord Carnarvon saw it. Here we have the context. 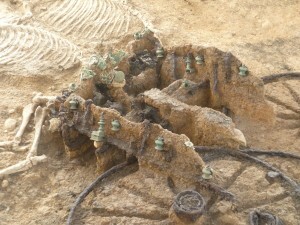 The horses’ skeletons are still attached to the chariot, and the large wheels lie exactly where they had collapsed. A skeleton of a dog rests on a small pillar of earth nearby. You can look down on the fallen chariot and make out the individual bronze fittings and decoration – though the chariot itself is little more than a lump of rust and earth. 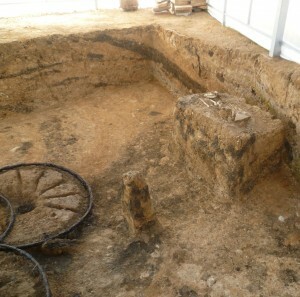 A pile of grave goods lie in two of the corners; the corner above has a large bronze cauldron, several terracotta flagons and a number of smaller bowls and a few spear heads. 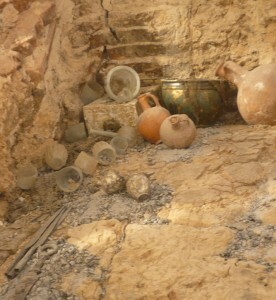 In the other corner there is a large bronze bowl and other bronze containers. 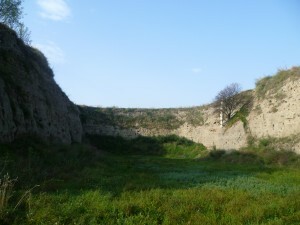 In the 1950s a massive slice of the tell was excavated to establish the stratigraphy. There are small labels down the cliff face giving the dates – with the Bronze Age burial date of 100 AD at the top and the earliest date of 8000 BC at the bottom. I don’t think we’d dare do such a destructive dig nowadays – it would be like taking a large pie-slice out of Silbury Hill. Now, although the chariot burial site has been left as found, what the visitor actually sees is something of a coup de théâtre. Objects have been removed and cleaned before being replaced where they were found – or at least giving the impression of where they were found; and some are copies of fragile originals. Nevertheless, it was a thrilling experience and I gladly suspended my disbelief. It certainly gave me the feel of what the burial must have looked like in its original state which you simply cannot get in an ordinary museum. What is so exciting, is that Bulgaria has thousands of these tells and very few of them have been excavated. And they can’t all have been plundered by tomb robbers, surely. Elizabeth visited Bulgaria with Andante Travels. All photographs by the author. I agree that seeing the excavation in situ is particularly exciting, even if there is some ‘fakery’ involved. If its necessary to properly preserve the items, than I’m OK with that. So I shall now add this to my very long list of places to visit. Thank you for your comment, Janet. Bulgaria is the most beautiful country with fantastic scenery and fabulous Thracian tells (tombs), which look like tumuli, only more so. The sculpture and decoration inside the tombs are breath-taking. Sorry for such a list of over-the-top superlatives, but that’s how they are!